There’s nothing worse than a messy car. If your vehicle starts to get cluttered, you can’t find the things you’re looking for, you begin to lose space, and you run the risk of something perishable getting lost in the mess, and causing damage or a foul smell. Unfortunately, keeping a car from getting messy isn’t always easy, especially if you spend a lot of time in your vehicle, or go on road trips in it. You probably already chuck a bunch of stuff in your car cargo box. Furthermore, keeping your car clean on the inside isn’t as simple as just taking everything out of the cabin. There are some things that you want or need to keep in your car at all times, but simply leaving them on the floor or seat feels chaotic and messy. That’s why we’re a big fan of car seat organizers. Car seat organizers allow you to keep a lot of your vehicle items in order, just like a desk for your car. They reduce mess and clutter, provide specific spaces for things, and in general make your car feel a lot more spacious and organized. On the surface, the Lusso Gear organizer looks like a pretty standard car seat organizer. We put some of our standard vehicle items in it, and it seemed normal. Then we put some more things in the organizer, and then a few more, and then some extra stuff, just for good measure. Even when full to the gills with heavy items, this car seat organizer maintained its shape, structure, and rigidity. 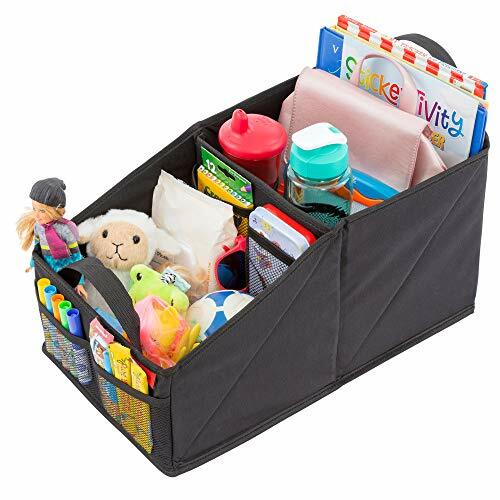 To us, that was highly impressive; you don’t want to have a limit for what you can put in your car seat organizer, especially if you go on a lot of long trips. But with extra reinforcement at the top of the organizer, you don’t need to worry about that with this model. This organizer is as perfect for someone in the backseat as it is for keeping your car de-cluttered. At the front and center of the Lusso Gear model is a tablet holder, and there are two cup holders on the organizer. And perhaps best of all, this car seat organizer is waterproof, so you don’t have to worry about what’s in the cup holders. We loved the Lusso Gear organizer, and they’re confident that you’ll love it as well, offering a one-year money back guarantee. Ultimately, we have a hard time finding anything wrong with this model; you simply can’t go wrong. 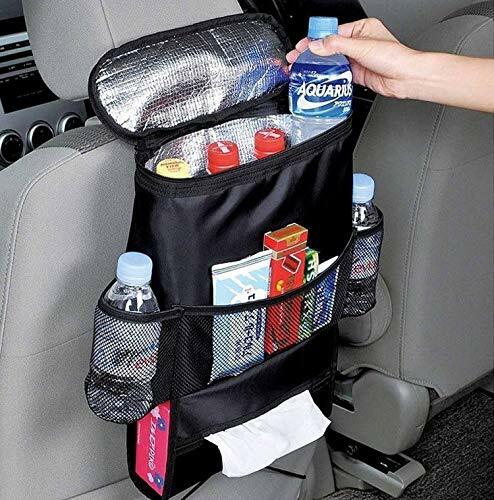 If you want to keep your car hospitable, and as close to a limo as possible, this is the car seat organizer for you. This organizer doesn’t hold as much as most of the models on this list, but it’s designed to offer luxury and practicality. The main pocket of the Autoark Standard Car Seat Back Organizer is an insulated pouch, which can keep your food at a stable temperature. It’s a perfect area to put cold drinks, if you want them to stay cold and refreshing on a hot day. With cup holders on both sides of the model, this organizer was made to help you stay hydrated, with your drinks just an arm’s reach away. That said, the cup holders are very small, and won’t fit large drinks. To top it off, the Autoark model has a pouch for a box of tissue paper as well. In other words, if you’re looking for a car seat organizer to hold your umbrella, maps, and loose change, this probably isn’t the one for you. But if you want to make the back seat a more luxurious place to sit, this organizer is perfect. The only problem we encountered is that it feels a bit on the cheap side, and didn’t seem particularly durable. For the price, however, you can’t go wrong. You can buy the Autoark Standard Car Seat Back Organizer here. The first thing we noticed about the YupBizauto organizer was the heavy-duty nylon, which feels incredibly strong. It’s immediately clear that this car seat organizer is top quality, and won’t be ripping, tearing, or sagging. That goes a long way in our book. With that said, some consumers have reported ripping problems in the bottom of this organizer, though we had no such problems. This model has six pockets, and they’re large enough that you can store a whole lot of stuff in there. The tablet pouch at the bottom keeps your electronic secure, while also allowing you to watch content on it hands free. The straps on the YupBizauto Car Auto Front and Back Seat Organizer make it easy to install, and easy to adjust, so that it fits your seat perfectly. We were really pleased with this car seat organizer. If you want large pockets, lots of storage area, and quality material, you’ll be pretty pleased too. This organizer is designed around fitting a tablet. The result is a model that you might want to avoid if you’re simply looking for storage and organization, but is absolutely perfect if someone in the backseat is going to use a tablet. The main attraction is the tablet pocket, which holds a tablet up to 10.1 inches. The pouch keeps the tablet secure and safe, but thanks to the clear touch-screen material, you can still use your device, and watch videos on it. It’s a stellar design, and we had a great time tooling about with it. 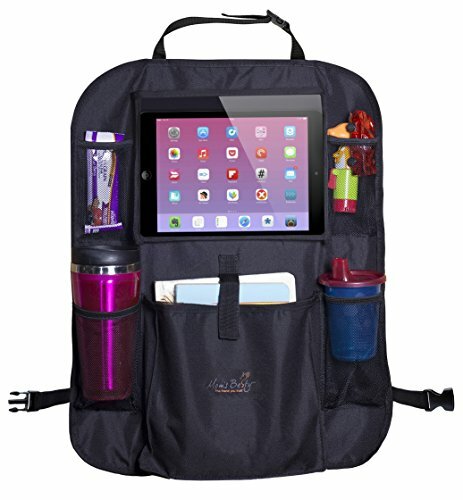 The Mom’s Besty model also has an enormous pouch for larger items, and four mesh pockets that can be used for organization, or as cup holders. And in case you’re not sold, this car seat organizer comes with a cleaning cloth for the tablet screen, and a lifetime guarantee. We used this in multiple cars, for both short and long drives. 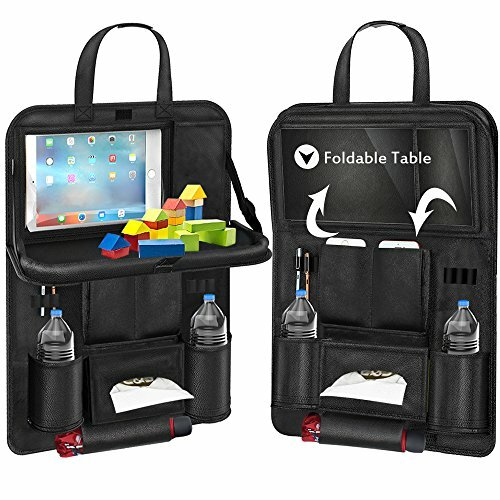 If you want a car seat organizer that allows you to use your tablet, this model is simply perfect. Ever wanted to keep your car organized, clean, and convert the backseat into your own restaurant? Yeah, us too. And that’s exactly what you get with the Pushingbest Car Back Seat Organizer. The Pushingbest model has a fold-down table, just like the ones you get when you’re in an airplane. The table is fairly strong and sturdy (we tested it with a paper plate and a bottle of soda, and it was just fine), and with a rimmed edge you don’t have to worry about items sliding off of it. However, we wouldn’t recommend putting too much weight on the table. Right above the table (or hidden behind the table, when it’s folded up), is a tablet holder, which fits a tablet up to 10 inches, and allows you to use your tablet hands-free. 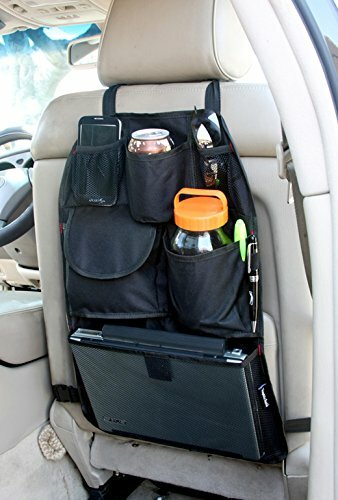 Between the tablet holder acting as a TV, and the folding table, the Pushingbest Car Back Seat Organizer really mimics the airline experience, or at least the good aspects of it. However, this model isn’t just about the food and tablet experience. This organizer has 10 pockets, which means that you can really keep your vehicle from being cluttered and messy. And with a waterproof back, and premium PU leather, you can rest assured that the Pushingbest model will stay in tip-top condition, and looking great, so that your organization and cleanliness is always available. Ultimately, this car seat organizer has just about everything you could want. It’s a little pricier than the other options here, but you get what you pay for. The second Lusso Gear model on our list is a bit different than the other car seat organizers in this article. Unlike the five other models, this Lusso Gear organizer doesn’t hang on the back of your front seat. Instead, it is placed on the back seat, or in between the front seats, and acts as further storage. This organizer has a ton of space, with two very large main compartments, a zippered pouch, and four mesh pockets, which can be used for storage or as cup holders. Because of the shape and size, we found this to be the perfect car seat organizer for people who like to store a lot of things in their car. If you keep books and magazines, or toys for your kid, or your running shoes and snacks in your car, then this is a great option. We loved it for large amounts of in-car staples. This Lusso Gear organizer isn’t for everyone, as it takes up more valuable space than the back of your seat. But it can hold more items than any other organizer we tried, and if that’s what you’re looking for, you’ll be very pleased with this unit. Car seat organizers can go a long way towards making your car clean, tidy, and organized. A non-messy car is an absolute joy, and very easy to achieve. Whatever car seat organizer you decide is best for you, we’re sure you’ll love having an organized and put together interior. 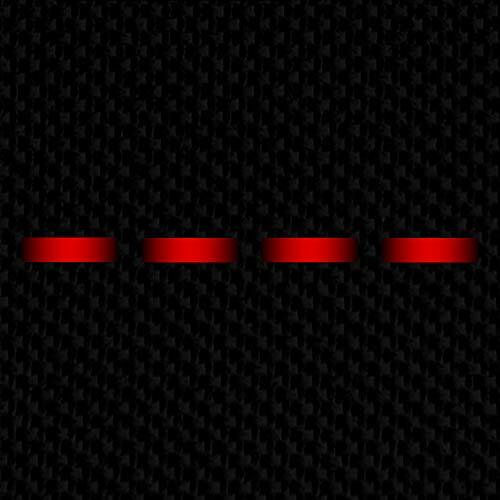 Happy driving!